For 16 years, the Ultimate Fighting Championship has been the gold standard in combat sports. Now you can re-live the 100 greatest fights in UFC history with this once-in-a-lifetime collection. 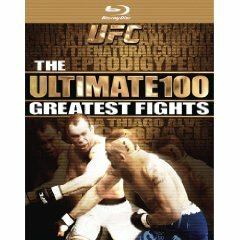 Featuring all the greats of the Octagon, from Royce Gracie and Chuck Liddell to Matt Hughes and Randy Couture, this set contains the most dramatic, explosive and memorable battles of the UFC in their entirety from 100 down to the greatest UFC fight of all time. These fights are shown in their entirety, not just the highlights shown on Spike-TV. While I enjoyed this set there were some fights which went missing. It could have been better though if personal differences between Dana White and some of the former UFC stars did not effect the selection of the fights. As an early fan of the UFC, there are many fights missing from this collection. Most of those, featuring Tito Ortiz, Frank Shamrock, Robbie Lawler, etc…. all fighters who (at the time of the creation of this collection) are not on good terms with the UFC president, Dana White. Some of Frank Shmarocks fights, Tito Ortiz vs Ken Shamrock 1, Wanderlei Silva vs Rich Franklin, Shogun vs Mark Coleman 2 and a few others did not make the list due to the issues with Dana White. A lot of these fights are on Ultimate Knockouts and compilations like the best of 2007 and the best of 2008 DVD sets. I know that these fights were “voted” on but still there are some that could be switched. In the build-up for UFC 100 over the summer, Spike TV aired a 5-episode series called UFC: ULTIMATE 100 GREATEST FIGHTS, where they counted down the 100 greatest fights as voted on by UFC fans. With fans voting on a list like this, it is sure to create controversy and debate, but one thing for sure is that these were all awesome fights regardless of numerical order! Unlike, the television special which aired clips of the fights, all 100 complete fights are included in this Blu-ray collection. 1. Stephan Bonnar vs. Forrest Griffin I (TUF 1 Finale). The print is presented in 1080p/AVC MPEG-4 with a 1.78:1 and 1.33:1 aspect ratios. The presentation is a mixture of standard 4:3 and high definition 16:9 aspect ratios. Aspect ratios will vary from fight to fight as this is a countdown minus a chronological order. While the standard definition broadcasts do not look the greatest, it is the high definition fights that shine in a major way. One thing that sticks out is the attention to fine details in each high definition fight. The image is rather colorful and vivid having an image that pops. Blacks are rather strong. Considering that these are broadcasts of the fights, the image is sharp through and through when it comes to the high definition fights. In the end some might feel like its an issue with the standard definition fights, but all in all this works out well due to the top notch quality of the fights. The audio is presented in Dolby Digital 2.0 mix. Again, staying with the current source material like we did with the video presentation, the audio is presented in DD 2.0 mix. Definitely this will be a front heavy presentation. Dialogue is clean through the front surround speakers, yet I could only imagine how this could have sounded if they would have gone back to give it a 5.1 mix. If you are a fan of the UFC and have been for the past 16 years, you will not want to miss out on this set spread across 6 Blu-ray’s. I wish that there were more fights in this from the earlier years considering that some of the most influential fighters were passed on due to possible issues with Dana White it is a shame. The video and audio presentation is a representation of their original source material. Included with the special features is the entire 5 episodes from Ultimate 100 Countdown Show. Chuck Liddell will win anyway! I am 100% sure about it! I even put bet on Chuck Liddell, as Franklin is no match for him. Ever due to the fact their feud in UFC 107 in December, there have been numerous occasions, in which it was thought that Evans and Jackson may collide next to one one more. Even so, Jackson announced a retirement, which did not final for often, but fit the match on hold. Now, with the star announcing a return, fairly much recently, the feud has been reignited. Both of them will get an possibility to settle their differences the moment and for all when they go head-to-head against 1 an additional in UFC 114 on May well 29.